As a member, you will also be able to hold office and vote at our annual meeting at the picnic. You can join with your donation by using PayPal or completing the form below and mailing it to us. A few years ago, several trees on our property fell and others were considered dangerous and threatening neighbors' buildings. 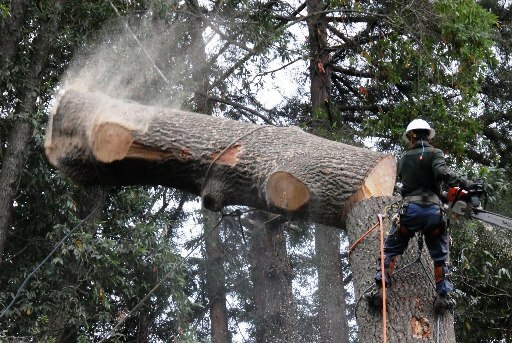 We have worked diligently to have the trees removed, but found many complications to a seemingly easy task. Because of the proximity to the creek, we need to apply for permits from the County Planning Department and the State Department of Fish and Wildlife. When the permits were issued, they came with many required conditions (from protecting the Thompsons Long Eared Bats to planting three new trees for each tree removed). We were forced us to hire 3 biologist as well as a professional tree company. The total cost of this project was over $15,000. The Soquel Pioneer and Historical Association is a volunteer organization that relies solely on donations. FORTUNATELY, WE RECEIVED MANY GENEROUS DONATIONS TO HELP FUND THE TREE PROJECT, BUT WE ARE STILL ABOUT ﻿$8,000﻿ SHORT OF RECOVERING THE MONEY SPENT. PLEASE CONSIDER DONATING THIS YEAR SO THAT WE MAN CONTINUE TO PROVIDE FOR OUR COMMUNITY. Our annual free potluck picnic, open to the public ; Picnic expenses include sound equipment, sanitary facilities, etc. Insurance and taxes on Pringle Grove. One quarter of the Porter Memorial Library annual cost in exchange for a room where we keep historical books and information for the public. Maintain this webpage with historical information for the public. Maintenance of the Soquel Signs found at the four entrances to Soquel. I wish to become a member of the Soquel Pioneer and Historical Association. Please note, any donation of $100 or more will be matched by an anonymous donor up to $1000.